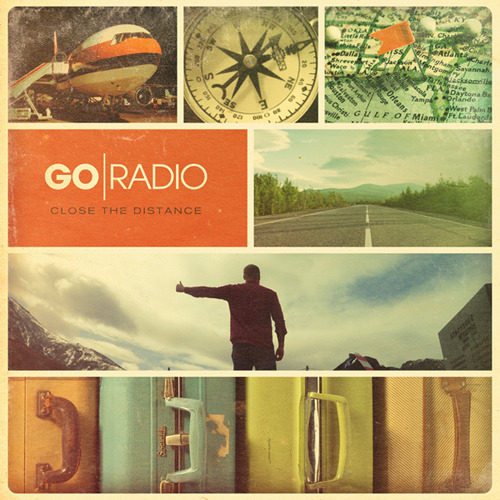 Go Radio had the reputation of being possibly one of the most forward looking bands on the Fearless Records roster. Vocalist and songwriter Jason Lancaster was among the best in the scene, and even while debut album Lucky Street had its ups and downs, it showed the potential of a band who could make pop rock that was catchy, intelligent, and still kept their own sound. On their second album Close The Distance, there was hope that they'd leap to the next level, combining the power and intensity of Lancaster's voice with even better songwriting. Instead they are now settling into a safe, radio friendly pop rock band. However, this doesn't mean they aren't good at what they do. "I Won't Lie" is an enormous redemption after the extremely boring Lucky Street eponymous opener, immediately igniting the album in full force, with one of the band's biggest choruses to date. It's a perfect introduction of their more relaxed sound, in which the poppier aspects of their sound are pushed more towards the front and the aggressiveness of earlier songs such as "Kill The Beast" and "Fight, Fight" is largely ignored. The poppier sound is reinforced with much cleaner production. It's obvious that there was a major attempt to lose a lot of the distortion and sound like a "bigger budget" project, meant to appeal to a much wider crowd. The guitars are far less heard than before, working more with the rest of the instruments rather than taking over the sound. There's definitely an effort to accent Lancaster's voice as by far the main attraction of the album. Lancaster's voice loses some of its rougher moments, instead sounding far more settled than it had been in the past. "Baltimore" is a highlight of his new vocal style, as his accent is toned down a bit and overall feels a lot more "classically strong" that it had in the past. He definitely sounds like a better singer than he was on Lucky Street, which fits the plan that the band and label seemed to have for this record. But while his voice sounds the best it has ever sounded, there feels to be a lack of passion, especially compared to tracks such as "House of Hallways" and "Hold On." The work spent removing the imperfections from the vocals actually takes away from one of Lancaster's biggest strengths, the emotional strain behind every word he sings. Lead single "Go To Hell" is one of only a few songs that reach that forcefulness, but it still feels underutilized, especially considering the angry lyrics of the track. His voice always had a special sort of power to it, and some of that now feels lost behind its more accessible sound. The emotional aspect in Lucky Street was also accented by the amount of ballads and slower tracks throughout the album. While they could have been better placed, the large number of them showed that the band wanted to highlight the style of track that they always succeeded at. Close The Distance cuts the reliance on these slower tracks, using them as breaks to slow down the album rather than their tool of choice. But even while the ballads aren't as prominent, they're still among the most important tracks on the album. "What If You Don't" is Lancaster's usual piano ballad, which he unsurprisingly nails. The song is simply his voice, piano, and some cello, and the more stripped down songs are usually where he succeeds the most. Closer "Hear Me Out" is the obvious climax to the album, featuring an enormous build up that includes some of Lancaster's most impressive vocal work, including some very sustained notes that seem impossible to hold without running out of breath. But Lancaster absolutely nails these notes, and those moments are chill inducing. It's just a tad disappointing that those breathtaking moments are far less common in Close The Distance, because some of the songs are extremely well written. The hooks are far catchier than in Lucky Street, and the record is far better organized. Just because a band goes in a poppier direction, it doesn't mean that they've lost everything that made them special. Go Radio thrives under these conditions, but some times it's just a little much. Sometimes a little roughness is needed to personalize the album, and sadly this isn't the case this time. Close The Distance is an enjoyable listen, but the personality holds it back from being far more.